Although the economic sentiment index of Hungarian think tank GKI was rising constantly in the last quarter of 2018, it declined slightly but steadily during the first quarter of 2019. The deterioration in March, as in February, was attributed to unfavourable business sentiment since consumer expectations improved somewhat both in February and March, and they reached the level recorded at the end of 2018. Hungarian economic actors continue to show strong optimism. Business expectations have been worsening slightly but steadily since December, mainly as a result of the decline in the industrial confidence index. Production expectations weakened in industry, and the assessment of the stock of orders (excluding exports) and inventories deteriorated as well. Investment intentions anticipate last year’s modest growth. From the second half of 2018, the construction confidence index has fluctuated in a relatively narrow band. Following its growth in February it dropped to its level at the beginning of the year in March. The prospects of companies in structural and civil engineering also declined slightly. The assessment of production in the previous quarter and that of orders also deteriorated slightly. Following a four-month decline and one-month stagnation, the trade confidence index rose in March, and it is close to the top of the relatively narrow band in which it had fluctuated for the past five years. The assessment of sales positions and the level of stocks improved significantly, whereas that of expected orders became slightly more pessimistic. Despite its rise in March, the confidence index in services did not reach its level at the turn of 2018 and 2019. The evaluation of the current business climate and sales expectations improved, whereas the turnover in the last period deteriorated slightly. The decline in employment intentions compared to the end of 2018 continued in March in all sectors, and although all sectors continue to plan an increase in employment, these intentions have markedly weakened in 2019. At the same time, the fear from unemployment of households continued to ease in March. Intentions to raise prices intensified in industry and services, whereas they became more subdued in construction and especially in trade. Inflationary expectations of consumers also became somewhat more moderate. The assessment of the Hungarian economy’s prospects became more favourable both in the business sector and among households in March; however, it did not reach its level at the end of 2018. 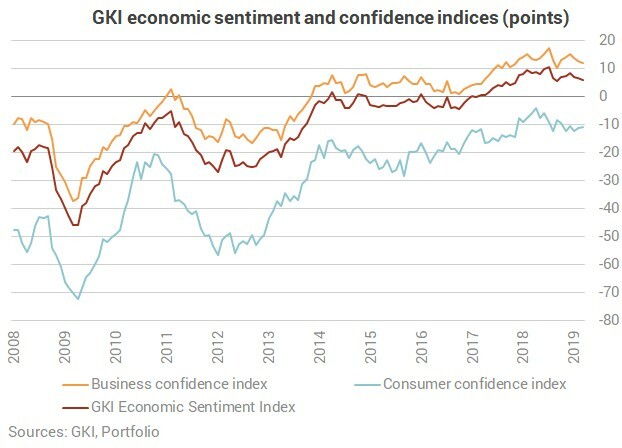 The GKI consumer confidence index improved slightly both in February and March, and practically reached its level at the end of last year. In March, households assessed their financial situation slightly better than in February, whereas they considered their savings capacity somewhat worse. Households considered the possibility of purchasing high-value durables slightly more unfavourable as well.